"Everyone in the audience is an idiot, but together they're a genius." There's nothing quite like listening to a master talking shop, and that's exactly the opportunity we're given with this documentary. 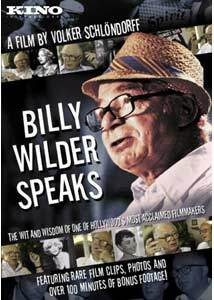 In the late 1980s, Billy Wilder agreed to sit for a series of interviews with director Volker Schlöndorff, on the condition that the footage not be exhibited until after Wilder's death. Wilder alas passed away in 2002, and Schlöndorff has edited the interviews into this winning look at an irascible character and gigantic talent. The men speak in Wilder's Beverly Hills office, the bookshelves heavy with screenplays and Oscars; Wilder alternates between English and his native German, which may be no surprise, because his interviewer is German, and yet it's still a little jarring to see this master of the American vernacular more at ease in a different tongue. Anyway, we get a very brief biographical overview, beginning with Wilder's Austrian childhood, his move to Berlin as a young man, and fleeing the Nazis, first to Paris and then to Hollywood, in 1933. His first U.S. success was as a screenwriter for Lubitsch, on Ninotchka, among other pictures, and one of the mantras of Wilder's own career became, "What would Lubitsch do?" The bulk of the documentary, though, is a more or less chronological, anecdotal look at Wilder's best-known films as a writer-director. He describes his uneasy collaboration with Raymond Chandler on the screenplay for Double Indemnity, battling with the studio over the title of Love in the Afternoon, the trick photography involved in the opening shot of Sunset Boulevard, trying to coax the words out of Marilyn Monroe on take 83 of a scene from Some Like It Hot. There are finely honed anecdotes about Gary Cooper and Gloria Swanson, Humphrey Bogart and Otto Preminger and James Cagney, Jack Lemmon and Walter Matthau, and frequent Wilder collaborator I.A.L. Diamond. You get the sense that Wilder has been spinning these stories for years, and in fact many of them are familiar, especially if you've read Conversations with Wilder, a series of free-ranging interviews conducted with the director by filmmaker Cameron Crowe. The most intriguing part of the film, in some respects, is Wilder's discussion of Death Mills, which he directed for the Department of War in 1945, a look at the concentration camps that killed most of Wilder's family along with millions and millions of others. At just over an hour, this documentary just scratches the surface of Wilder's career—how could it do otherwise?—but it's always a pleasure to hear him, and will send you scrambling for DVDs of the director's own films. Image Transfer Review: A workmanlike transfer, though the clips from Wilder's films actually look pretty slick. Audio Transfer Review: The 2.0 track is sufficiently audible; and don't worry about brushing up on your German, for subtitles are provided. 17 Other Trailer(s) featuring The Major and the Minor, Five Graves to Cairo, Double Indemnity, The Lost Weekend, Sunset Boulevard, Love in the Afternoon, Some Like It Hot, The Apartment, One, Two, Three, Irma La Douce, Kiss Me, Stupid, The Fortune Cookie, The Private Life of Sherlock Holmes, Avanti! Extras Review: A raft (01h:06m:15s) of 21 deleted scenes nearly double the length of the documentary—included are Wilder's discussions of some films that didn't make the cut for the feature (including Five Graves to Cairo and Ace in the Hole, the latter still one of the great lacunae of the DVD catalog), along with little tidbits like stills from the original ending of Double Indemnity, with Fred MacMurray in the gas chamber. Schlöndorff provides some set-ups for these clips, so occasionally it does feel a bit padded out, but his admiration for Wilder couldn't be more clear, either here or in the accompanying essay, in which he writes about Wilder as an inspiration both personally and professionally. Along with a Wilder filmography is a bushel of trailers for the director's own films, along with a very early TV spot, promoting Sunset Boulevard, and an appeal from Jack Lemmon to the good people of Cleveland to show up at Municipal Stadium—aka The Mistake on the Lake—to be extras in The Fortune Cookie. A lovely and unexpected chance to visit once again with perhaps the greatest American filmmaker, who's as cranky, quick-witted and ready to dish as you might expect. It's a modest disappointment that this is only just over an hour long—but then, nobody's perfect.